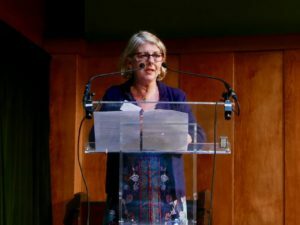 Jenny Bourne, IRR veteran, writes on what the memorial event for A. Sivanandan held on 23 June at Conway Hall, meant for her. Early in 1972, the whole staff of the Institute of Race Relations invaded a specially-convened meeting of its Council of Management in a Jermyn Street boardroom to tell these usually ‘absentee landlords’ that they would no longer accept their rule. 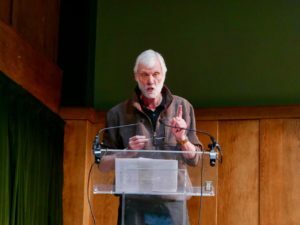 Lords Boyle and Walston, Sirs Seebohm, Prain, Pedler, Birley, professors, MPs, media magnates and multinational CEOs heard in no uncertain terms that they knew nothing about the reality of lived racism and imperialism and had no right to determine what the IRR should research and publish and who should do it. Forty-six years later in Conway Hall (not St James’s) over five hundred people gathered to celebrate the person who had directed that invasion, the then librarian, A. Sivanandan, and the work that still follows in its wake. It was a great tribute – but there was, too, a certain irony not lost on those of us who had been around in the early 1970s. We had been told by the Jeramiahs that without its traditional backers, the IRR just could not last; we had been told that there was no readership for a journal themed on racism and imperialism; we had been told by academics that it was they who should now determine our research; and Sivanandan had been told he just did not have the skills to edit a journal and certainly no right to change its title from Race to Race & Class. There have been difficult years: months when we did not know how to pay salaries; moves that had to be done, with friends assembling library shelving overnight; attempts by fascist groups to intimidate us and the New Right to close us down. But our achievements and impact have been huge. We have a permanent home (for which in part we have to thank the Greater London Council); we have an internationally renowned journal Race & Class, now in its forty-fifth volume (distributed via an established publishing house, Sage, which contributed to the filming of the event); we have a research programme headed by Liz Fekete, one of the foremost analysts of European racism and fascism. 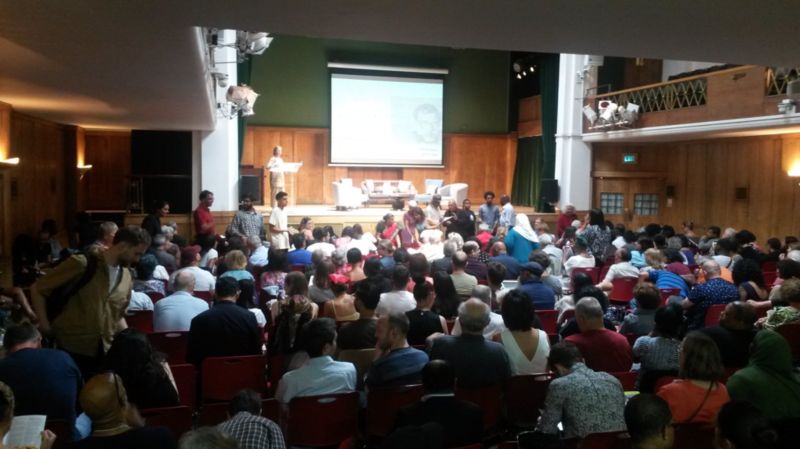 What was so significant about the event ‘The heart is where the battle is’: a celebration of Sivanandan’s legacy was the array of people and organisations represented there. Two members of the Upper House (come to laud not lord it) but also two former central committee members of Marxist parties; young feminists but also key figures in the formation of Britain’s black women’s movement; student anti-fascists, but also members of the former CARF Collective and the editor of Searchlight; doctors, teachers, lawyers, journalists, academics and, above all, community activists. And not just from across the UK, but from the USA, India, Italy, France, Belgium, Norway, Denmark and Germany. Artists like Linton Kwesi Johnson, John Pandit from Asian Dub Foundation, playwright David Edgar and poet Chris Searle paid homage to Siva from the stage, whilst I caught a glimpse in the audience of a member of a popular drum and bass band and Grenfell community videographer Daniel Renwick had edited film material for the event. A woman, who, as a schoolgirl, had first been helped to philosophical literature by Siva, then in Wembley’s public library service in the early 1960s, was rubbing shoulders with a generation of young Tamil activists who knew Siva through his novel When Memory Dies which had provided for them the backdrop to understand the horrors of the Sri Lankan government killings of 2009. Siva and the Institute of Race Relations had stood the test of time. The Jeremiahs could not have been more wrong. What was important about the event was the way it showed up the issues and principles that Siva had stood for, the impact they had far and wide and the urgent need to now apply them to a new political climate of extreme repression and growing fascism. This was a looking back only as a way of celebrating and honing a particular perspective and political practice. In the light of current moves – towards elevating identity politics, emphasising ‘unconscious bias’ and changing just attitudes and representation – the meeting was constantly recalling the aptness of Siva’s practice reflected in down-to-earth aphorisms: ‘who we are is what we do’, ‘the racism that kills not the racism that discriminates’, ‘thinking in order to do not thinking in order to think’; his method of ‘lived theory’ and the urgency to build ‘communities of resistance’. The IRR will continue to keep his thinking alive and is working with a publisher on a new Sivanandan collection and creating a website of writings and speeches. To see the programme for the 23 June event,(PDF 3MB). To watch the event on youtube.